Allow me to provide a brief apology for the length of this post: I simply had too much material to fit into a post of my usual length. But the projects I discuss are fascinating ones, so hopefully you’ll forgive my going beyond my usual standard. Franklin 299, the 305-unit apartment complex on Franklin Street (behind our main Public Library). Elan Redwood City (aka “103 Wilson”), the 175-unit apartment building under construction on Jefferson across from Sequoia Station. Huxley, which is under construction on El Camino Real on the site formerly occupied by Redwood Trading Post. This seven-story apartment building will contain 137 apartments. Greystar IV (not its final name), which will soon break ground on El Camino Real next to Huxley (where Treadmill Outlet and the veterinary clinic used to be). 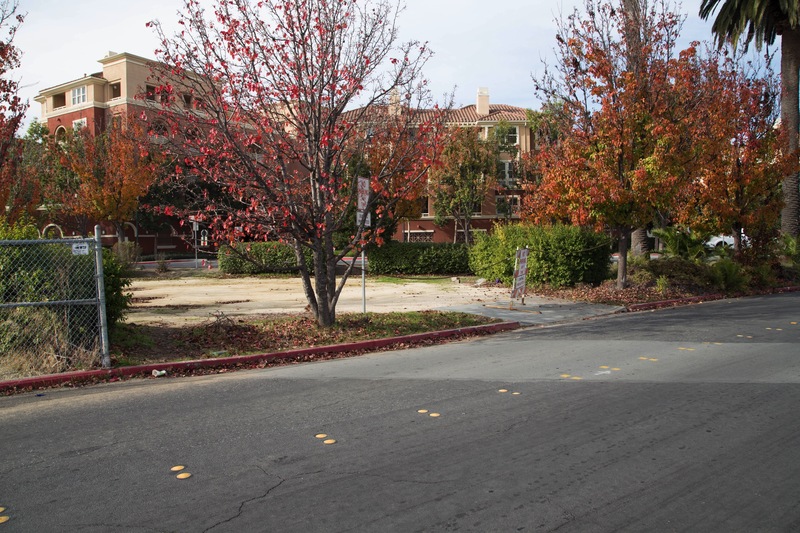 This project consists of a large 350-unit apartment building that will stretch from El Camino back to Franklin Street. 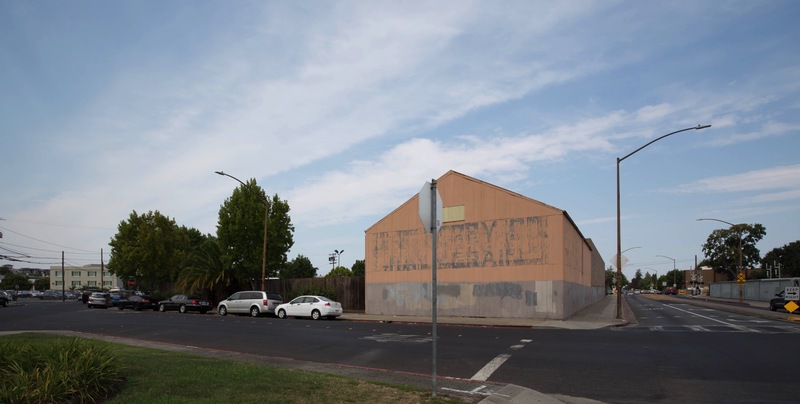 Greystar clearly knows a good thing when they see it, which is why they’re back with their newest project proposal: the Beech Street project (or, as it is referred to on the city’s Development Projects web page, “1601 El Camino Real”). Unlike their previous four projects, this one is not a single building, and it includes a significant office component. While the project they are proposing does include a residential building, Greystar has managed to cobble together several properties and is proposing to build one apartment building and four office buildings on what today is six blocks (totaling 8.3 acres). Whereas the apartment building would be on a scale with what Greystar is currently building on El Camino Real—seven stories, stretching just over 81 feet in height—the office buildings would be noticeably smaller. One would be four stories high (61 feet) while the others would be three (47 feet). All told the four office buildings would provide roughly 590,000 square feet of office space. Until recently the above list would have included the Redwood Roller Rink, but they recently closed. Also, West Coast Insulation and Fireplace used to occupy a large warehouse-style building on one of the properties, but they seem to have moved to Hayward, leaving their building empty. Other properties are being used for overflow vehicle storage by Towne Ford; until I got out and looked I hadn’t realized just how much land that one business was occupying. The preliminary plans note that the above-pictured parcel is “not currently controlled by Greystar,” but don’t be surprised if between now and project approval (assuming it gains approval) this part of the block is incorporated into the project. Hopefully you now have a good idea as to where this project would go, and what would be displaced. 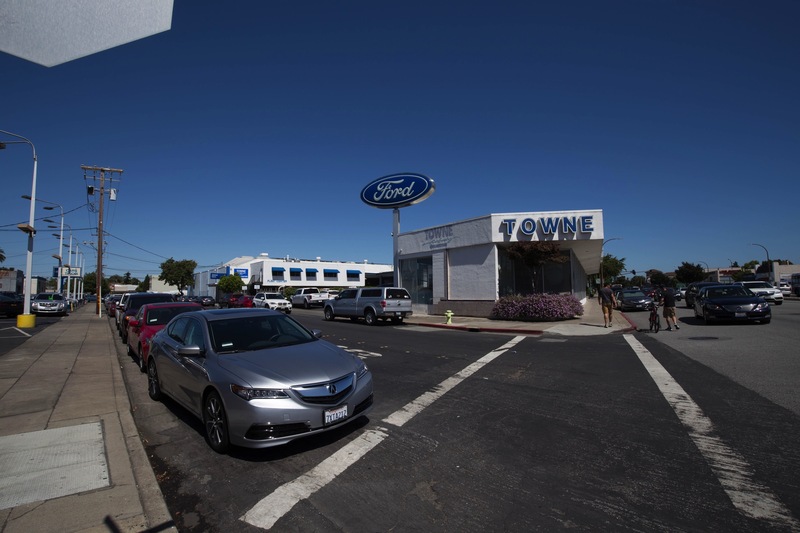 It’s too early to know for sure what would happen to the existing businesses, but, it tentatively appears that Towne Ford and Hopkins Acura would move out to join the Boardwalk auto dealerships and that Main & Elm would close. As for the city-owned low-income apartment building (“a majority of which are currently uninhabited,” according to the developer), the proposed project would include enough affordable apartments (60, in total) so as to make up for the loss of this building. On the right is “Building B,” a four-story office building (the three-story brick portion in the front is part of the one building). This building stands out in that it would contain, on the ground floor, a 10,000 square foot public childcare facility and, along its Beech Street frontage, “active” space to engage passersby: retail, perhaps, or a restaurant, a gym, or something along those lines. Between the two, in the back, you can see part of Building C, and you may just be able to make out a green plaza (“Lathrop Park”) in front of it. Buildings D and E are not visible in this rendering. All five buildings would have underground parking garages. I was a bit disappointed to learn that Greystar plans to valet park the majority of the cars: Buildings C, D, and E would be entirely valet parked, while Building B would use valet parking for the lower two levels of its garage (the topmost parking level includes 60 public parking spaces; that level would be entirely self-parked). The apartment building would also be entirely self-parked. Because this section of Beech is only about 2-1/2 blocks long and terminates at the Caltrain tracks, it mainly exists to provide access to the two auto dealerships and as a place to park. It actually has some pretty decent sidewalks but they don’t go anywhere interesting, especially now that the roller rink has closed. Contrast today’s Beech Street with the vision presented in the previous rendering. Greystar’s plan is to make it much more pedestrian-focused—although automobile traffic would still be allowed. 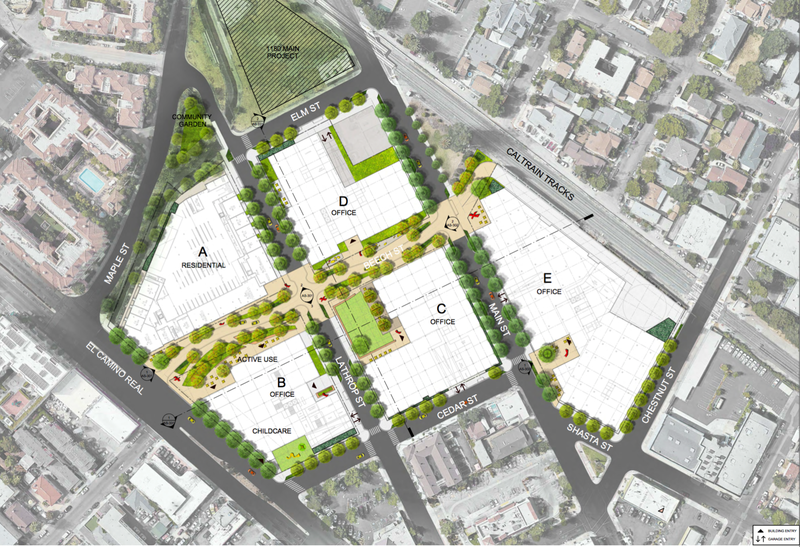 A small “corner plaza” in front of Building B at the corner of Beech and El Camino. “Lathrop Park,” at the corner of Beech and Lathrop. The developer says that this would be “similar in scale to Courthouse Square,” and the specs seem to indicate that it would be roughly 17,000 square feet in size. A “corner plaza” by Building E at the corner of Beech and Main. 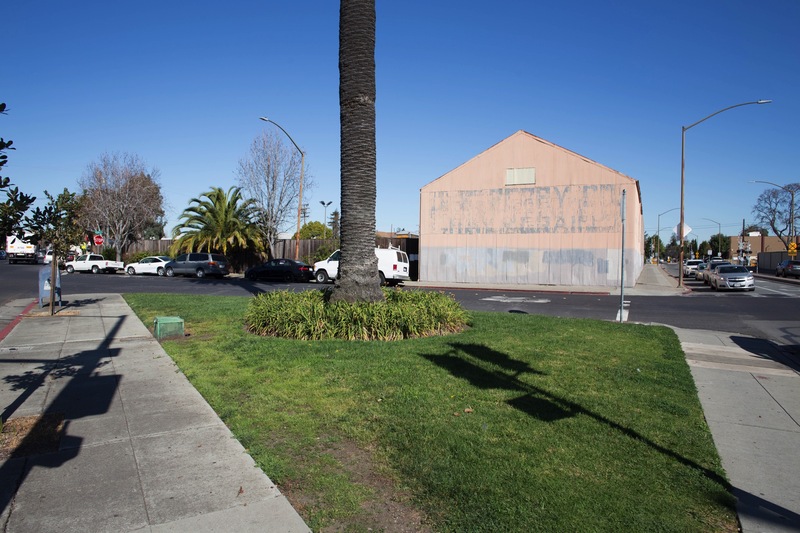 The developer is hoping to work with the city to do something more interesting with the adjacent small bit of Beech Street that dies into the Caltrain tracks. Today, it is closed off with bollards to make it an informal extension to the adjacent Main Street Dog Agility Park. Although owned by the city, the developer is proposing to turn it into a community garden. Given the number of apartments that are (and would be) in the immediate area, a community garden is a good idea. This particular parcel, however, is fairly small. On paper it is about one-third of an acre, but Redwood Creek, which runs right through this parcel, renders a good chunk of the property unusable. As best I can tell, the usable portion of this particular parcel is only about 8,600 square feet, or about one-fifth of an acre. Which to my mind makes the property somewhat small, especially given the number of apartments in the area. It isn’t clear exactly what they are thinking, but one of the renderings gives the impression that they might want to close that small bit of Shasta Street between Chestnut and Main (in the above photo, the bit between the park and the metal building), and thereby connecting the triangular parcel to the block that would contain Building E. This would enlarge the triangular parcel and make it much easier for people to access and enjoy. In the above rendering the five buildings in the Greystar project are clearly visible. Appearing beyond Building A (the triangular apartment building) and Building D (which would replace Main & Elm and California Detail), almost as if it is part of the project, is a tall triangular building shown with little detail. 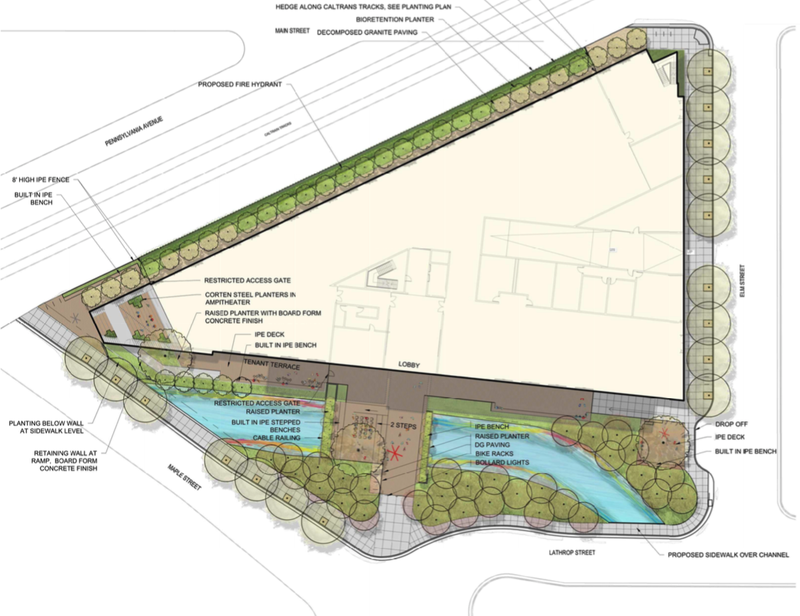 This is actually a separate project, proposed by another developer, for the empty lot across from Main & Elm. But given its proximity to Greystar’s project, I think it makes some sense to look at both projects together. Based on the renderings, I can see a lot of similarities between the above building and the office building proposed for 1180 Main Street. One significant difference would be the height: 550 Allerton is a six-story, 89-foot-high (not counting the air conditioners and that up-angled bit) building, whereas 1180 Main is to be a four-story, 56-foot-high building (also not counting a small enclosure that contains the elevator mechanicals). 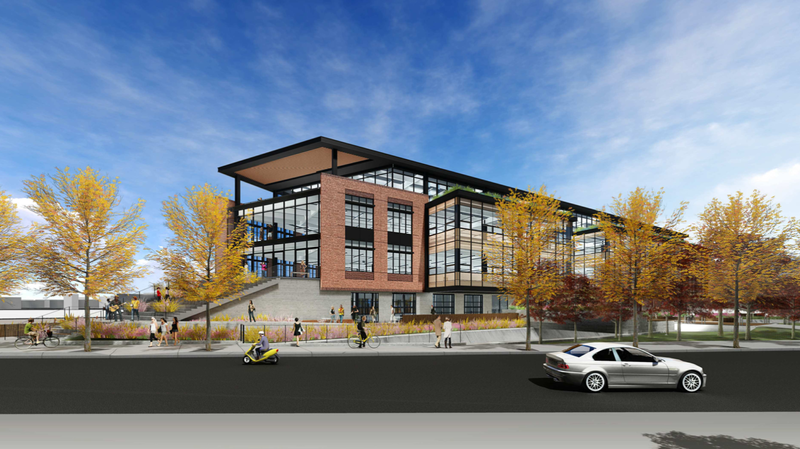 The building would also have a second-level entrance on one of its corners, accessible via a grand staircase that rises near where Maple Street crosses the railroad tracks to the truncated corner at the left in the above drawing. Additional character would be provided by the two two-story sections of the building that would jut out over the “tenant terrace” that runs across the building’s front. It comes as no surprise to learn that parking would be in a two-level underground garage that would require a valet in order to accommodate the required 425 cars. Entry to the garage would be from Elm Street, directly opposite today’s Main & Elm. Inside the building there would be accommodations for 72 bikes—for employees; there are also showers—while outside there would be racks that could hold up to 26 more, for visitors and/or for employees. As you can see on the landscape drawing, sidewalks would edge the property on three sides (Caltrain runs along the fourth, so a sidewalk there wouldn’t be prudent or necessary). And, of course, Redwood Creek would figure prominently in the building’s front entrance. All in all, this could be a dramatic office building that would make maximal use of a parcel that for years now has been a fenced-off, empty lot. Like the Greystar proposal, this one is still at the initial stage of the planning process: they’ve submitted a preliminary proposal and are presumably working with the city to complete their application. Then it will be subjected to a review of its design and its environmental impacts, after which it will be brought before the city and the public in one or more public hearings. I for one look forward to that presentation and will be very interested to see what the city thinks of Premia Capital’s project. Greystar will go through a similar process, but given the added complexity involved in their project I expect that they will need more time. 1. The walking distance from the Caltrain station to the corner of Main & Beech is approximately 0.6 mile, taking either Winslow-Middlefield-Main St route or Franklin-Lathrop route. This may be on the upper limit of what some workers may be willing to walk, so I would expect a larger number of car commutes, as compared to the downtown core. Therefore, the number of parking spaces of the office buildings should not be compromised; do not allow valet parking to reduce the spaces required. 2. 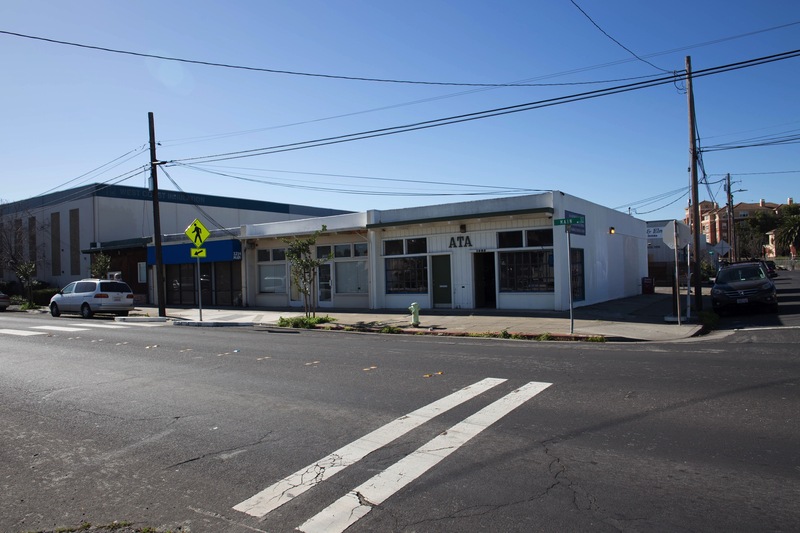 Building B on El Camino should be residential instead of office. Converting this building would produce a better office:residential balance. Even with the current residential projects going up, there’s still a need to keep improving the office:residential imbalance. Don’t be fooled by all the greenery. We’re still looking at 5 large tall office buildings. 3. I like Buildings A and E and 1180 Main as proposed. They make good use of the space, especially incorporating the 2 dead end segments on Beech and Cedar into the Building E plans. 4. I sure wish there was a way to rebuild the roller rink in one of these mixed use buildings. My daughter used to take skating classes, and had 2 of her birthday parties there. Lots of recreational activities have left RWC (bowling, roller skating, putt putt golf, malibu grand prix). 5. Looks like all the auto dealerships are leaving El Camino and moving to 101 frontage areas. It does provider greater visibility. Is there enough room out there? 6. I hope they can preserve some of the old industrial character of this area. Would be nice to keep Main & Elm restaurant, which did a wonderful job of creating a restaurant space in an industrial locale. Buildings C and D could try to incorporate more of the current buildings to blend the old with the new. @Samuel Y, I measured 2,100 feet (0.4 miles) via the shortest walking distance from the Caltrain platforms to the intersection of Lathrop & Beech, at the approximate centroid. That’s 8 minutes at a typical 3 mph walking speed. We already know from the new RWCmoves transportation study that driving and vehicle use is about half of what was projected for downtown office developments near Caltrain and SamTrans. And with the electrification of Caltrain and move toward higher frequency all-hours transit-level service with spiffy high-performance longer, faster, quieter trains … and with all the projections and trends regarding TNCs, driving and vehicle use, and what is well known about the role of available (esp. free) parking in commute mode splits, we should be minimizing parking. And why oppose more efficient use of precious and costly underground parking space with valet and/or mechanically-aided “stacking” parking technologies? Win-win. Eliminating these just means lower parking capacity or higher cost to build it larger for the same self-park capacity. Lose-lose. Let’s be smart, progressive and forward-thinking. We shouldn’t be designing the world and our cities for your parents’ world, let’s look forward to our childrens’ world. While the RWC Beech St. (aka 1601 ECR) project proposal is on 30% more land than Menlo Park’s Station 1300 project, it’s clearly significantly denser … as is true of most everything in RWC vs. historically more affluent suburban “residentialist” (aka NIMBY) cities. So you could sit back and say we should let Menlo Park’s historically lower density projects be our guide, or you could say they’re wasting (underutilizing) prime TOD land fronting ECR and across the street from their Caltrain station. A significant number of Menlo residents, merchants and electeds have for decades now been grousing how relatively moribund their downtown is as compared to those of other more lively Peninsula cities — now (proudly!) including Redwood City. 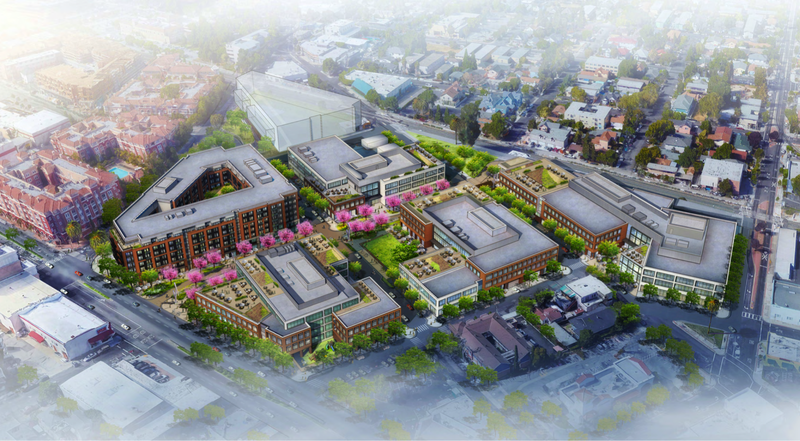 It has gone so far as Menlo Park council this year seeking to emulate Redwood City’s enviable and still-ongoing revitalization by prioritizing the pursuit of a downtown cinema & parking garage. Wow, Greg, you’ve outdone yourself. This is so thorough and well done that I’ve actually been sitting here studying your column. Good job! Greg, thanks for the detailed and well-written write up on this massive and unimaginative project. There is no doubt this area is ripe for development but I feel this project doesn’t reflect the true spirit of mixed-use development intended for this area. – Where are you coming up with the 60 affordable units? There will be a loss of 23 units at the city-owned site at 1306 Main and Greystar is proposing only 37 affordable units (for a net add of only 14 units). 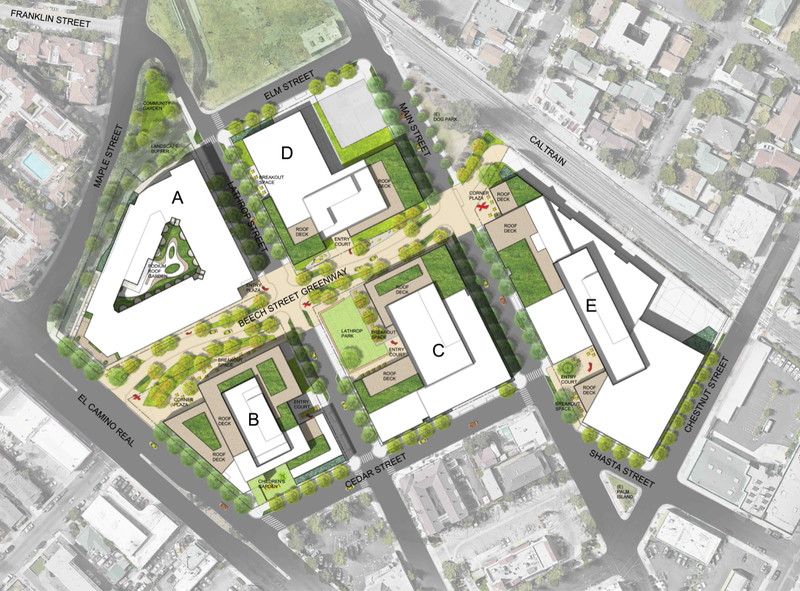 – The Greystar and Premia projects you described would bring 4,000 jobs to this compressed area of the City while providing only 276 housing units. The is a jobs/housing imbalance that should be unacceptable to our City officials given its impact on its residents (especially the 50% who are renters). At least with the Downtown Precise Plan, balance was ensured by categorical caps on office, housing, retail and hotel. 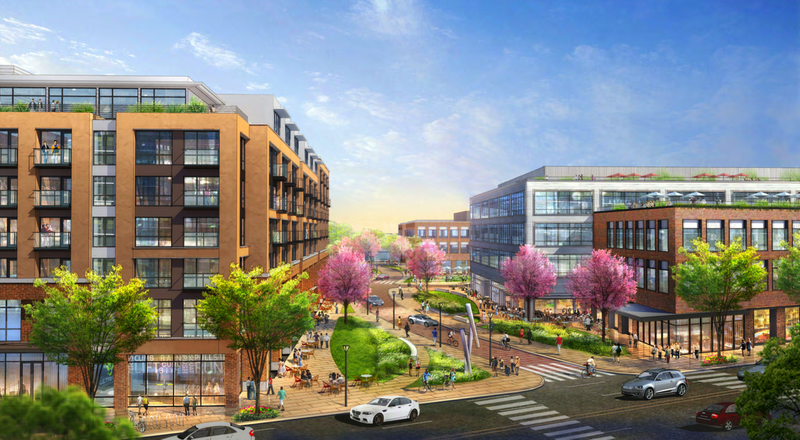 This Greystar project in no way represents the vision of a true mixed-use development. I would suggest that your readers check our Middle Plaza and Station 1300 in Menlo Park. Both projects are of similar size (area wise) to Greystar and are fantastic examples of enormous, yet tasteful mixed-used developments on El Camino. Greystar continues to peddle their dregs in Redwood City because we let them. Greystar alone is in the process of building just over 900 rental units one block over…it’s not exactly going to be a sea of office buildings in this general area. While the city might designate these two areas as separate planing zones they’d very much blend together when exploring on foot. I don’t necessarily disagree with you that there should be more housing in this proposal (or that this proposal needs further review/changes) but I do feel that these recently constructed/under construction rental units next door count for something (even if the mentioned housing units counted against the office allotment for the downtown area). I live in Redwood City on a street that waze likes to send commuters down…I think it’s appropriate for proposals in Redwood City to be larger than those of comparable land area in Menlo Park. I do like the station 1300 project. Either way hopefully Greystar will try to accommodate the varying opinions of those in town and come up with a semi-agreeable final proposal. Awesomely and clearly written! Keep it up! Thank you for all your great writing putting this together. Maybe I’ll take flak for this, but my opinion: The sooner the better. 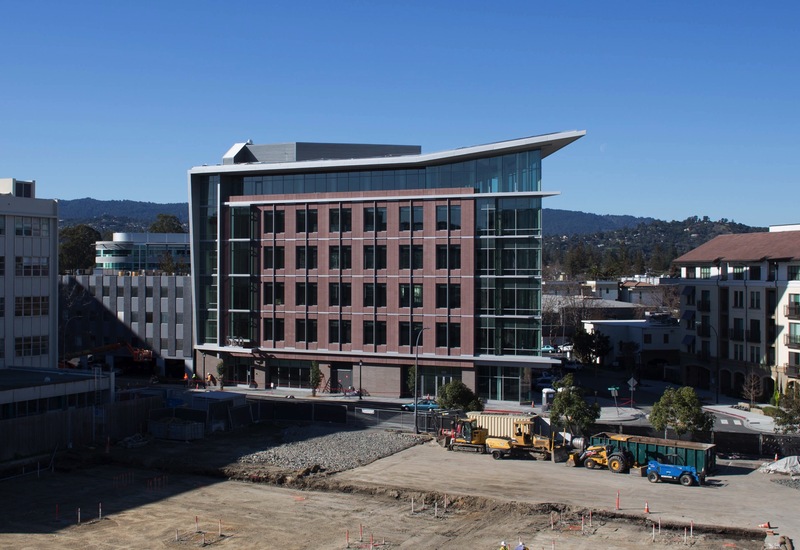 These new buildings are their tenants will draw even more people to the advantages of working and living in RWC. And the city gets a fresh look to build it’s advantages on. It’s going to be a city we can even be more proud of to bring people to. Thanks for your kind words. These are interesting projects that may or may not encounter the level of opposition other projects have seen, given their more manageable size and their proposed location. Of course, the mere fact that they will bring even more people to Redwood City will cause some objections. I for one will be following these projects with interest. I agree. The overall design needs some massaging and such, but overall I like the general concept. I especially like the 1180 main proposal — sharp looking building. Any ideas what’s going to happen to main & elm? Do both of these proposals comply with the existing zoning? As I mentioned in the post, it appears that Main & Elm would close. But between now and the start of construction a lot could happen, so who knows? As for the zoning, I’ll need to double-check that. Thanks for the reply! I’m sure we’ll find out soon enough whether or not this proposal complies with the current zoning. The most recent el Camino plan was accepted right? Or is that still a pending proposal? I just spent some time looking at the zoning, and to my eye it appears that the Greystar project does comply with the existing zoning. The two El Camino properties are MUC-ECR (which allows residential and office, among other things) whereas the other properties are MULW (which allows office, light industrial, among other things–but not residential unless it is part of a “live/work” unit). The buildings are taller than the base standard, but Greystar feels that they qualify for some bonus height (which, if you meet certain conditions is allowed). Assuming that this is true, the two El Camino buildings appear to be fine, height-wise, whereas the other three Greystar buildings exceed the limit (40′) by seven feet (they are 47′ tall). Greystar has a good case, I suspect, to get approval for the additional height (which again is allowed under certain conditions). 1180 Main, however, may have a slightly tougher time. The type of project is appropriate for their zoning (MULW) but they will need a variance to allow them to build since the height limit for their property is 3 stories and 40′ tall, whereas they are proposing a 4-story building that will be at least 56′ tall (that’s to the top of the main roof; the rooftop equipment is surrounded by a wall that will rise to 68′, but I’m not sure that they count that). Makes sense. Thank you for taking the time to respond.